Is the World Bank Funding Death Squads in Honduras? The Dinant Corporation and subsidiaries of the Jaremar Corporation, both Honduran African palm oil corporations blamed by campesino movements for the murder of approximately 80 campesinos in the Aguan river valley region since the June 2009 military coup, have received millions of dollars from the World Bank since the coup. Most recently, on November 2, 2012, Orlando Campos, Reynaldo Rivera Paz, and José Omar Paz – all former members of a campesino movement which contests rights to the “ Panama farm” against Dinant Corporation’s illegitimate claims – were killed in a drive-by shooting as they waited for a bus. The following day, in an unprecedented arrest of a death squad member, police officer Marvin Noe García Santos was arrested for these assassinations. On August 13, 2012, the Compliance Advisor Ombudsman [CAO] – internal agency of the World Bank that monitors compliance with Bank standards and safeguards – published its appraisal of a $30 million loan from the World Bank’s private financing arm, the International Finance Corporation [IFC], to the Dinant Corporation palm oil corporation of Honduras, and found that an audit of the Dinant loan should be conducted. This appraisal was “initiated by the CAO Vice-President in response to a letter submitted in November 2010 by Rights Action to the President of the World Bank Group in November 2010, and conversations between CAO and local NGOs.” It determined an audit of the World Bank loan’s social and environmental performance will be conducted. On November 17, 2010, two days after five campesinos from the Movimiento Campesino del Aguan (MCA) were killed by security forces employed by the Dinant Corporation owned by Miguel Facusse, Rights Action sent a letter to the president of the World Bank charging that the Bank shared responsibility for the killings given that, one year before, on November 5, 2009, the World Bank released $15 million dollars to Dinant, the first half of the $30 million loan. This World Bank loan disbursement occurred while a military-backed junta controlled Honduras , in the aftermath of the June 2009 military coup, and brutal State repression was again becoming systematic throughout Honduras . For months on end, every single day, peaceful pro-democracy protests against the military coup took place in the streets of Honduras , and were violently repressed by the junta. Death squads began operating again in Honduras , targeting pro-democracy activists. Faccuse’s Dinant Corporation has been involved in land rights disputes with campesinos since 1994 when, through violence and fraud, it began acquiring land titles to African palm cooperatives. Since January 2010, Dinant security forces have been accused of participation in death squad activities and are likely responsible for the murder of approximately 80 campesino land rights activists and bystanders. 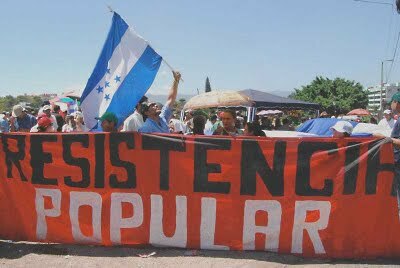 In reaction to the June 28, 2009 military coup, the Organization of American States suspended Honduras ’ membership from July 5, 2009 to June 1, 2011, when ousted president Manuel Zelaya was allowed to return to the country. While the OAS’s reaction to the military coup was a historic moment, as the nations of Latin America roundly rejected the dangerous resurgence of military coups in Latin America , the World Bank and the Inter-American Development Bank (IDB) continued to allow most funding to flow, only temporarily suspending the signature of new loan agreements. Honduran recipients of World Bank / IDB loan at the time of the coup were largely businessmen who also – not surprisingly – played a central role backing the coup, particularly Miguel Facusse. The World Bank’s reaction – actually its lack of reaction – to the 2009 coup contributed directly to the sweeping impunity enjoyed by the authors of the coup, the same climate of impunity which has spawned politically motivated death squad activity in Honduras on a level not seen in Central America since the years of US-backed military repression of the 1980s and early 90s. The World Bank’s role in basically legitimizing the 2009 military coup and post-coup junta demonstrates, once again, how urgent it is that multilateral investment banks not be allowed to act with such impunity, continuing with “business as usual”. All transactions of the “development” banks must be fundamentally based on the guarantee of human rights and compliance with international law, frameworks are almost entirely, rhetoric aside, ignored by the World Bank and IDB. The Operational Directives that govern the World Bank are completely inadequate and in no way provide a rights protective framework for people impacted by the Bank’s investment decisions … even as the World Bank, for the first time, begins to fund public security forces. It is unclear when this audit will or has begun, and whether it could lead to a suspension of the second disbursement of the Dinant loan, or whether the audit will address the Bank’s role in grave human rights violations and contributing to impunity in Honduras following the June 28, 2009 military coup. In 2008, Dinant lined up a series of publicly funded loans totaling slightly under $100 million from the World Bank Group, the Inter American Development Bank, the Central American Bank for Economic Integration (BCIE) and a German “development” bank. However, on April 12, 2011, the German state-owned development bank, DEG Deutsche Investitions, announced suspension of the loan after pressure from European human rights organizations. As of yet, the IDB and BCIE appear to have proceeded with funding. In addition, Dinant was actively participating in the Round-table on Sustainable Palm Oil (RSPO), planning ‘clean’ palm oil certification mechanisms, and had applied for carbon credits with the United Nations sponsored Clean Development Mechanism. While the large loans indicate that Dinant may have been preparing for expansion, the RSPO participation and UN carbon credits may have had other objectives, not just ‘green washing’, but ‘land laundering’. Land laundering is a term coined in Colombia to describe the various means employed by former paramilitaries to “wash” or give legitimacy to illegally obtained land titles. A key strategy in Colombia has been engaging with international “development” agencies, lending an air of legitimacy to corporations with dubious land rights claims and often heavily implicated in drug trafficking. The World Bank must get out of green washing and land laundering. The Bank’s actions assist in the robbery of land, stolen by violent actors that enjoy Bank funding, who actively undermine a functional justice system, and generate impunity for grave human rights violations related to the violent and illegal land grabbing. Annie Bird is co-director of Rights Action. Please write to the President of the World Bank (with copies to your own elected politicians) to express your demand that the World Bank suspend its $30 million loan to the Dinant Corporation of Honduras, an African palm oil corporation that belongs to Miguel Facusse, one of Honduras’ wealthiest persons and largest landowners, whose security forces, in collaboration with State security forces, are believed to be responsible for the murder of over 80 campesino land rights activists and their supporters in the Aguan region of northern Honduras. Demand that the World Bank explain why it continues to invest in a country controlled by a military junta, where the rule of law, the most fundamental element of a rights protective framework necessary for just development, is not functional. Demand that the World Bank ensure they never again provide funding during a military coup and that they stop supporting military coup supporters. "The government betrayed you, and we, without realising what you had shown us, fell back into the state's game of government corruption and the pretence of a democratic transition. As a result of that forgetfulness, the social fabric of the nation was torn even more," Sicilia told the Zapatistas in Oventic.